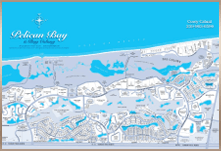 Salerno at Bay Colony is a luxury high-rise condominium tower in the prestigious Bay Colony neighborhood within Pelican Bay. Completed in 2000, Salerno at Bay Colony consists of 69 exclusive residences within 19 floors offering 2,600 to 5,200 square feet of luxury living area. Residents of Salerno at Bay Colony enjoy breathtaking views of the Gulf of Mexico and Clam Pass as well as being close proximity to fine dining and shopping at the Waterside Shops and the Mercato. Salerno at Bay Colony also has incredible 2 story penthouse residences with remarkable 20’ ceilings and exquisite interior appointments.